Milliken Company, Extended Stay America, a rapidly growing hotel chain, relocated its National Headquarters here. The Cancer Centre opened in 1999 and the Heart Centre is in the top 100 in the U.S. Located in upstate South Carolina, a region that has a population of 280 000, has a rapidly growing economy, 96 International businesses and 6 local colleges. The lot is located at 2219 Country Club Road south of the City of Spartanburg in Spartanburg County, South Carolina. The property is bounded by another lot on the north, Clyde Street on the west and private residences on the east and south. The lot is approximately 2.0 wooded acres. 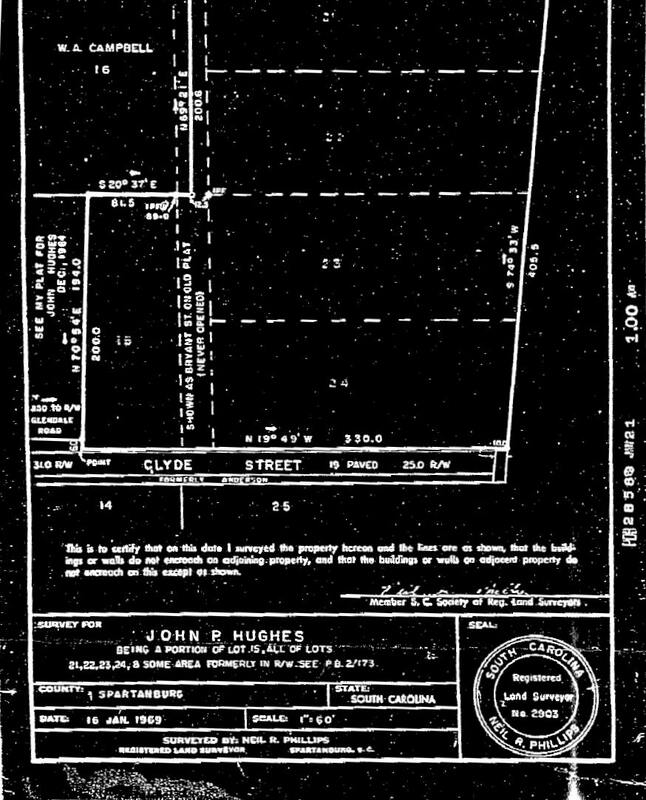 All that piece, parcel or lot of land together with improvements in the County of Spartanburg, State of South Carolina, situate and lying between Clyde Street (fomerly Anderson Street) and Connor Street and described as follows: Beginning at a point on the East side of Clyde Street at the corner of the property previously owned by Great Atlantic News Company, Inc., now or formerly owned by William W. Bomar and Boyce L. Bomar, Jr., and running with the line of said property North 70-45 East 200'; thence South 20-37 East 81.5' to an iron pin; thence North 69-21 East 200.6' to iron pin on Connor Street; thence South 20-27 East 280.3' with Connor Street to an iron pin; thence South 74-33 West 405.5' to an iron pin on Clyde Street; thence North 19-49 West 330' with Clyde Street to the beginning. This parcel consists of Lot Nos. 21,22, 23, 24 and a portion of Lot No. 15 and an adjoining area shown as a street (which has never been opened) on plat recorded in Plat Book 2 at Page 173 in the RMC Office for Spartanburg County. See plat for John P. Hughes by Neil R. Phillips dated January 16, 1969, and recorded in Plat Book 58 at page 413. 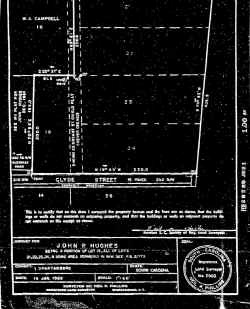 Said piece, parcel or lot of land is the same property conveyed to City News Agency Inc., by John P. Hughes by Deed dated October 3, 1972, and recorded in Deed Book 41-V at Page 744, in the RMC Office for Spartanburg County. CLICK HERE to visit the Spartanburg, SC Website. CLICK HERE to obtain an interactive map.